Aggregate of two small very sharp Shigaite crystals. 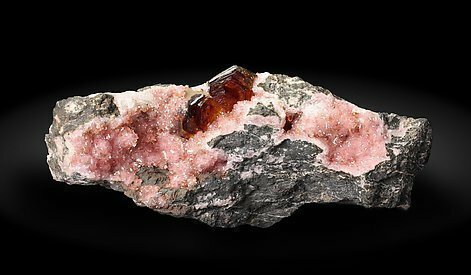 They are laminar, bright, with a very intense and deep color and on a rocky matrix coated by a botryoidal Rhodochrosite growth, very bright and with a very intense, vivid and uniform pink color. The whole sample is extremely esthetic. Laminar crystals of this rare species. 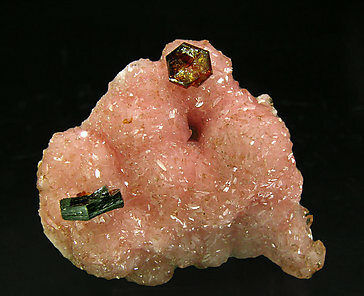 They have a sharp hexagonal shape, deep red-brown color and they are translucent, very bright, and are implanted on a matrix of Rhodochrosite crystals with a very intense luster and color and mainly formed by the prism and the scalenohedron. Laminar crystals of this rare species. They have a sharp hexagonal shape, deep red-brown color and they are translucent and very bright. 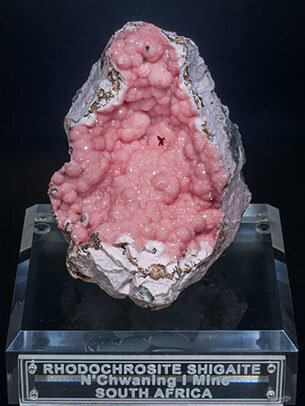 On Rhodochrosite matrix. Tabular crystals of this rare species. 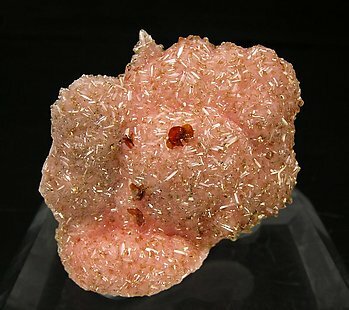 They have a hexagonal shape, intense red brown color, deeper near the edges of the crystals, from translucent to transparent and very bright. 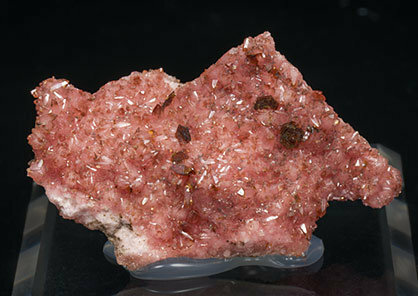 On Rhodochrosite matrix. Very aerial aggregate of laminar Shigaite crystals. They are bright and transparent, with a color between yellow and orange, and have a considerable size for the species. 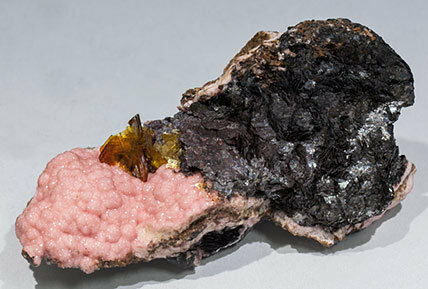 The Shigaite, on matrix, is implated on a botryoidal Rhodochrosite aggregate and it is with crystalline Siderite. Not bad for the species.